Showing results for tags 'necrosis'. 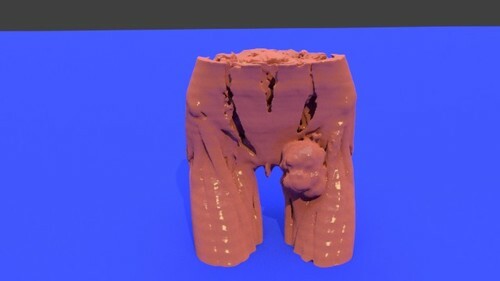 This 3D model represents a case of high grade leiomyosarcoma implicating the left groin region of a 24 years old female. The patient was treated by surgical excision follower by chemotherapy as well as radiotherapy. A cross sectional CT image is attached showing the lesion in axial, coronal and sagittal planes. Leiomyosarcoma (LMS) is a very rare malignant neoplasm that arises from smooth muscle cells and is considered to be the malignant extension of leiomyoma. Leiomyosarcoma is classified under soft tissue tumours and represents around 8% of all soft tissue malignant tumours. Common locations affected by leiomyosarcoma are: the uterus, retroperitoneum, stomach, oesophagus, small intestine and generally anywhere with smooth muscles. Leiomyosarcoma appears heterogeneous in CT with common central attenuation representing necrosis. This 3D model was created from the file STS_036 The source CT scan used to create this model can be found here.